Heriot’s will have two new faces in their line-up when they welcome Currie Chieftains in tomorrow’s Tennent’s Premiership play-off semi-final (3pm). Having gone through the campaign with no professionals at his disposal, coach Phil Smith has three full-timers available. Winger Jack Cuthbert – who was released previously but withdrew on the eve of a match – and centre Mark Bennett, will make their debuts for the Goldenacre outfit. Meanwhile, prop Murray McCallum returns to the club where he played before moving into the pro ranks, and will start on the bench. Matches between the teams have been hard fought in recent years and Smith wants this latest episode to be no different. The visitors have had the edge over tomorrow’s hosts this season. Heriot’s lost four times during the campaign, twice to Chieftains, who won 27-23 at Goldenacre early in the league programme then squeezed home 11-10 courtesy of an injury time drop goal by Gregor Hunter at Malleny Park in January. The Goldenacre men secured home advantage when they edged out tomorrow’s opponents for second place in the table on the final day of the regular league programme. Heriot’s will be competing on two fronts over the next two Saturdays, with a league and cup double in their sights. 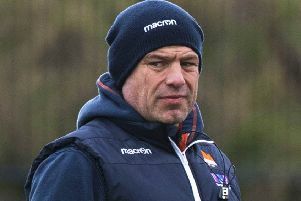 But Smith is completely focused on the job in hand, and is looking for the older heads in his squad to lead by example. “We will look to our experienced players to guide the game plan to wherever it needs to go and be aware of the threats that Currie pose,” he added. 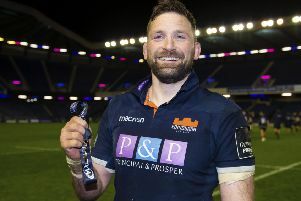 Chieftains have been bolstered by the return from the professional ranks of former Malleny Park favourites Thomas Gordon and Luke Crosbie, as well as Glasgow Warriors prop Adam Nicol. Vince Wright is also back after international duty with the Netherlands. Although they have yet to reach the final, Chieftains have progressed to the knockout phase every year since the play-offs were introduced and coach Mark Cairns believes that will stand them in good stead this time. The match will be the final outing before league reconstruction and Chieftains have an extra point to prove having been unsuccessful in their bid for a Super 6 franchise. Cairns is using that snub to fire up his side before league reconstruction and the departure of several rising stars to the Super 6 set up. “It’s not about reaching the final to have a chance of winning the league, but simply to have another opportunity to play alongside each other again,” he added. The prize for tomorrow’s winners will be a clash with either Ayr or Melrose. Should Ayr see off the Borderers, they will have home advantage for the final. However, if Melrose take the honours at Millbrae, Heriot’s or Chieftains will host the showdown for the silverware.